As with most commercial foods, salt is a major ingredient not just for taste, but to preserve the foods shelf life. These low-sodium dill pickles in this recipe are, in my opinion, actually better than the brand name pickles and will stay fresh in the refrigerator for up to 2 weeks. Oh, and they’re really easy and fun to make too! For this recipe we’re going to use pickling cucumbers or “Kirby” cucumbers, where are perfect for home pickling. After we slice and dry the pickles for a few minutes, they will take a bath in boiling water with vinegar and a few pickling spices, without any salt at all. 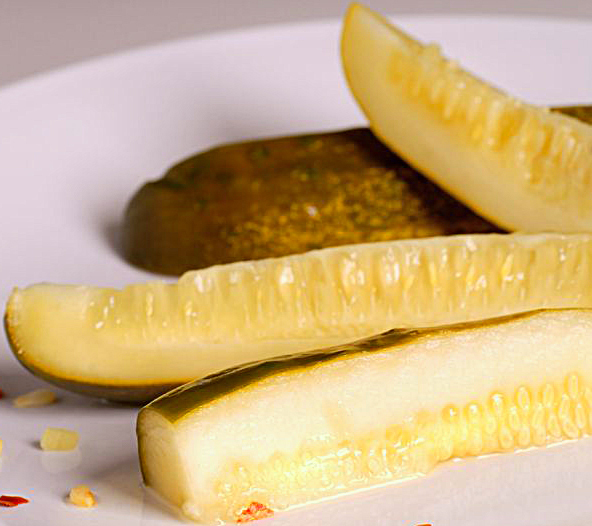 You’re gonna love these low sodium dill pickles. Enjoy them as you would any commercial dill pickle – with a sandwich or as a snack. One thing I really like to do is chop them up to put in tuna salad. Enjoy! Slice pickles in to spears and place on paper towels to soak up as much moisture as possible for about 10 minutes. Add all remaining ingredients to a large saucepan and bring to a boil over high heat. Add spears, reduce heat to medium and cook for 3 minutes. Remove pan from heat and let cool for 15 minutes. Transfer pickles and juice into airtight containers or jars and refrigerate for 4-6 hours before enjoying. Will keep in fridge for up to 2 weeks.